IMPORTANT NOTICE TO READERS: Flash forward one year: The Heaterz brand heated grips I installed did not even last a season. The right grip became intermittent in the fall of 2014, and failed altogether within a few weeks. 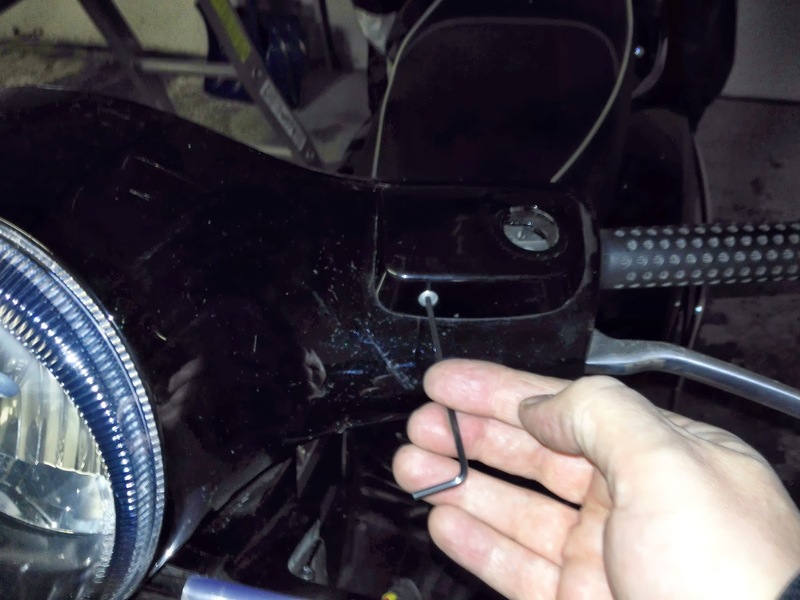 I sought assistance on the Modern Vespa forum (click here), and at least one member with a lot of experience indicated that the throttle side will fail as a result of the throttle movement. 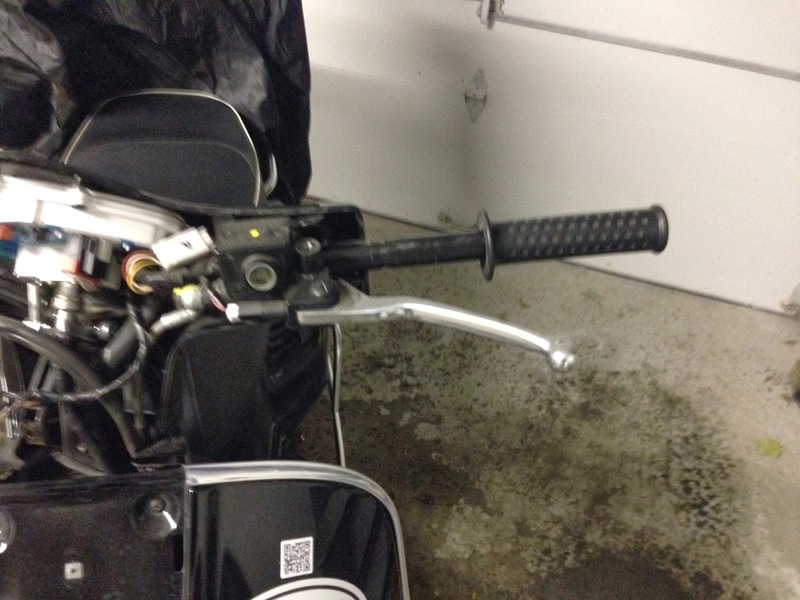 That was certainly not my experience with the US-made Hot Grips™ brand heated grips. For that reason I'm tearing off the Heaterz and installing Hot Grips™. Live and learn. Though the Heaterz leads look more impressive than the Hot Grips™ leads, looks in this case are deceiving. I attempted to remedy the problem by eliminating the quick connect terminals and soldering the wires (no joy, it's the grip itself that failed), and what I discovered is that the wire looks good, but it's all fairly flimsy insulation, and the copper filaments are much fewer than in the Hot Grips, and that's a large part of the quality equation. 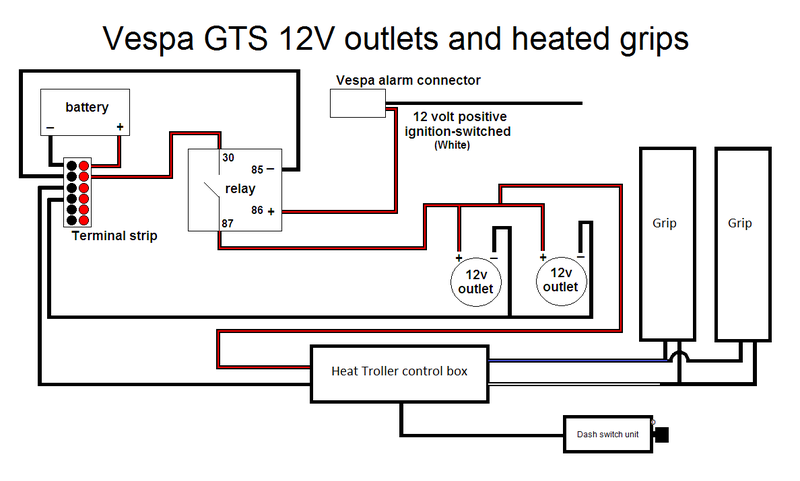 This post remains interesting for the installation procedure for heated grips on a Vespa GTS, but please avoid the Heaterz brand of grips. Flash forward to March 2016: For the post where the Heaterz were replaced by Hot Grips™, click here. 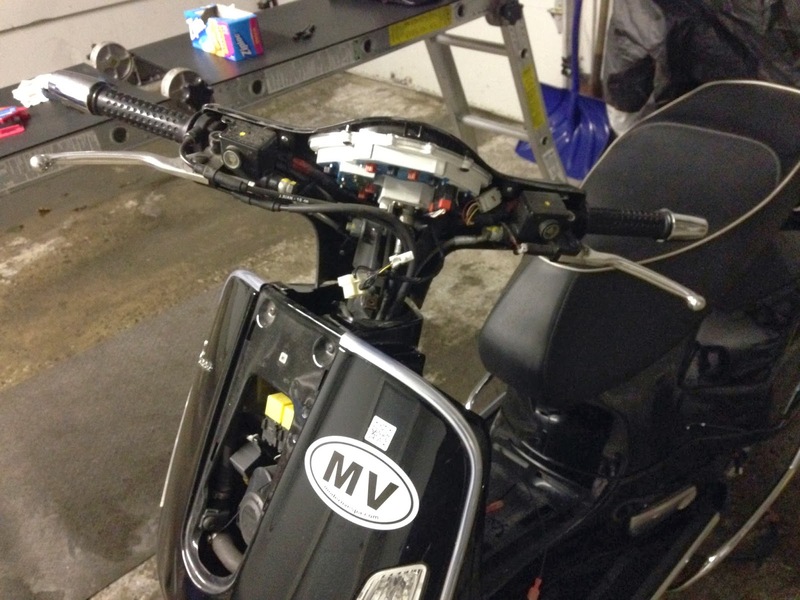 This is the second time I am installing heated grips on a Vespa motor scooter. 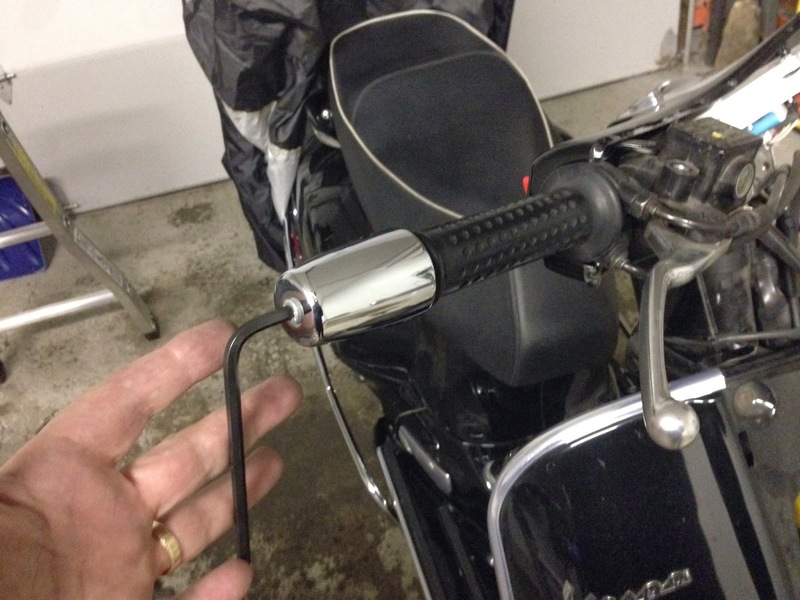 The first time was the installation of Hot Grips™ brand heated grips on a Vespa LX 150 which I have since sold. You can see the project report on that installation by clicking here. Once you get used to the comfort of heated grips, there's no going back, so here we go again, another heated grips project. This time around the project is being done on a Vespa GTS 300 i.e. Super. The nice thing about the GTS is that the electrical system is well-known to be able to support heated grips. 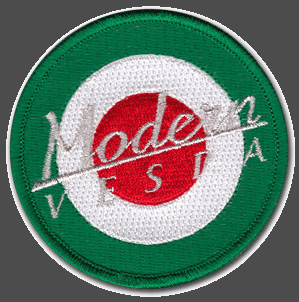 There is plenty of anecdotal evidence on the Modern Vespa forum of successful installations. The other difference with this project is that I was unable to get Hot Grips™. They would have been my preferred product but they are no longer exported to Canada. The supplier I used last time, Lockitt.com in New Hampshire, suggested the Oxford Heaterz brand grips. Those are made in the far east rather than in the United States. The grips themselves are said to be of equivalent quality, but there is some evidence on the 'net that the electronic controller has failed. For that reason I decided to stick with the Warm & Safe Heat-Troller® solid state control. The other advantage with the Warm & Safe Heat-Troller® is that it can be mounted in a way that all you see is the control knob and the LED status light. That's a big plus over the Oxford controller. I'm not sure what the elegant way would be to install that on a Vespa. I think that some owners have found a way to install the control in the glove box. I wouldn't do that because the glove box is already very small and that would also mean giving up any chance of changing settings while riding. When I had heated grips on the LX 150 I would frequently adjust the setting during my commute in response to changing conditions. 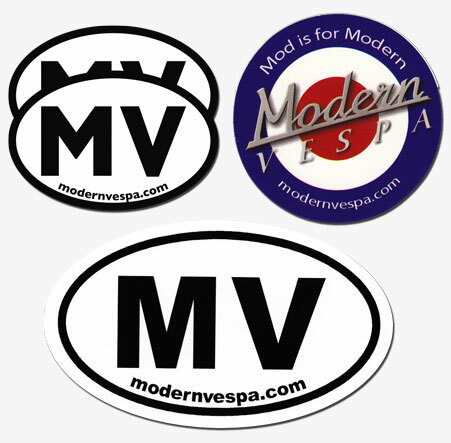 Finally, we Vespa owners love the classic iconic Italian design of the Vespa and prefer not to install farkles that get in the way of the Vespa look. Another change from the Vespa LX to the Vespa GTS is that GTS has 'kneepads' at the top left and right of the legshield. They are more like hatches to the interior of the legshield and not really kneepads at all. The right kneepad gives access to the coolant reservoir and offers little in way of customization opportunities because the coolant reservoir takes up almost all the space on the right side. It's the left kneepad that offers a world of options. 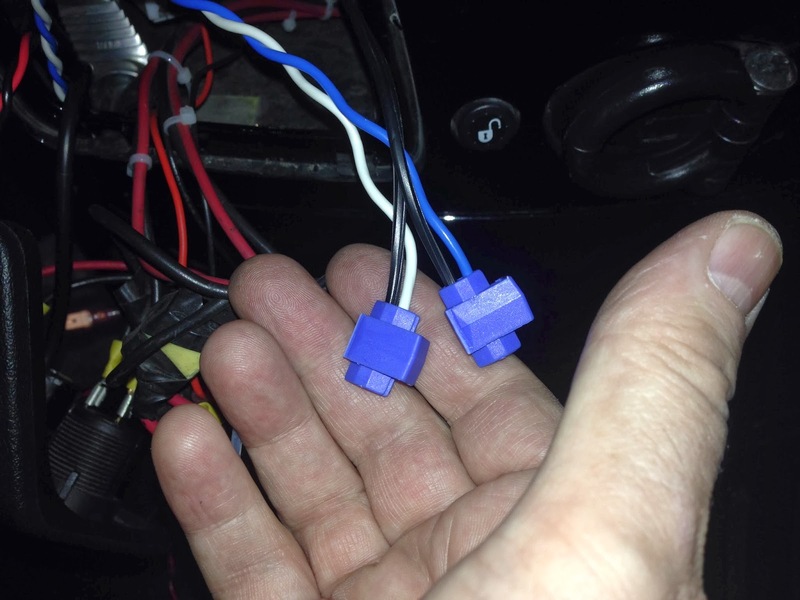 I had already installed dual 12 volt outlets to power electronics (click here for that project report), and I also installed a switch that one day will provide four-way hazard flashers. 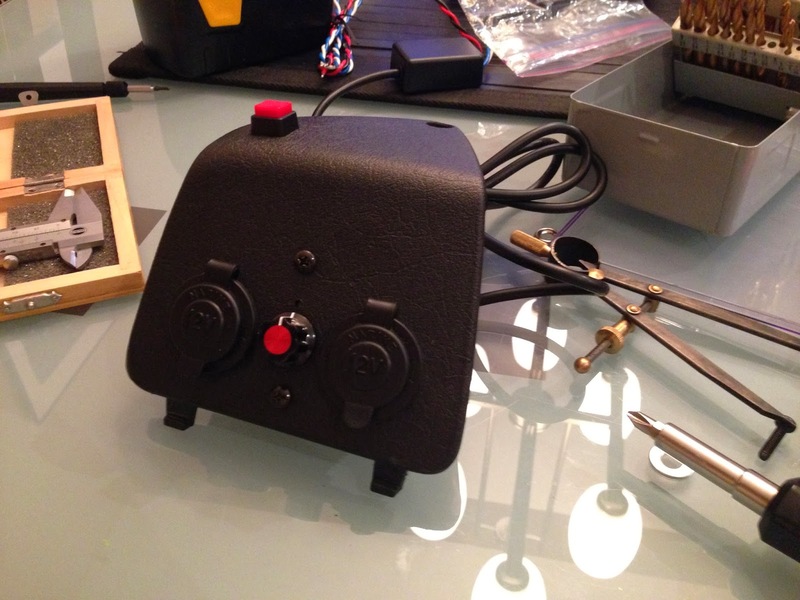 I still haven't wrapped my mind around that one, so all I have for now is a push-button switch that goes nowhere. There is room on the left kneepad for the control knob and LED of the Warm & Safe Heat-Troller®, so that's where it needs to be. It's slightly less convenient there than on the handlebar fairing which is where I installed it on the LX, but the kneepad is not inconvenient either, and if ever I want to return the bike to stock, all I need to do is buy a new left-side kneepad. 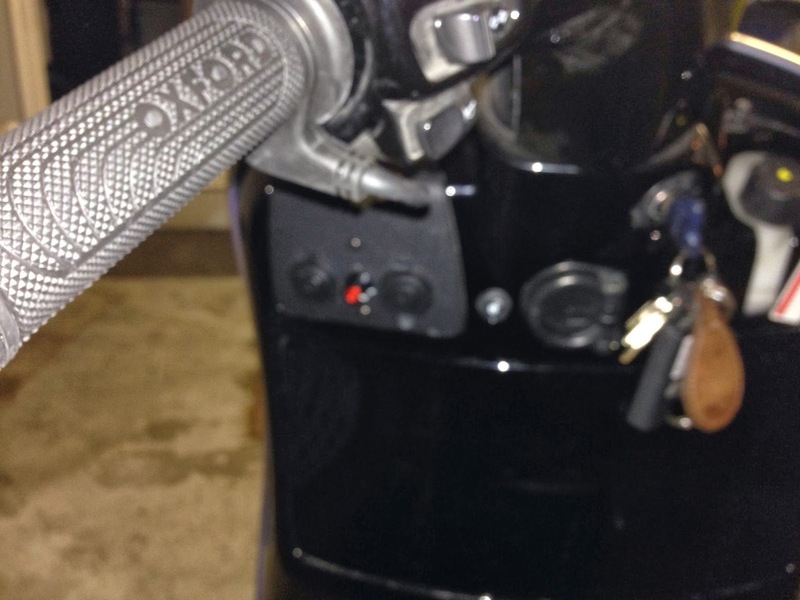 With those preliminary remarks out of the way, without further beating around the bush, here is how I installed the Oxford Heaterz heated grips and the Warm & Safe Heat-Troller®. So let's get started. You'll see that I've numbered the paragraphs to make referring to the instructions easier, if need be. As a final preliminary note, please read the entire project report before you begin. That way if I've gotten a step in the wrong place from your perspective, you'll be aware before the bike is in pieces and you're in tears. 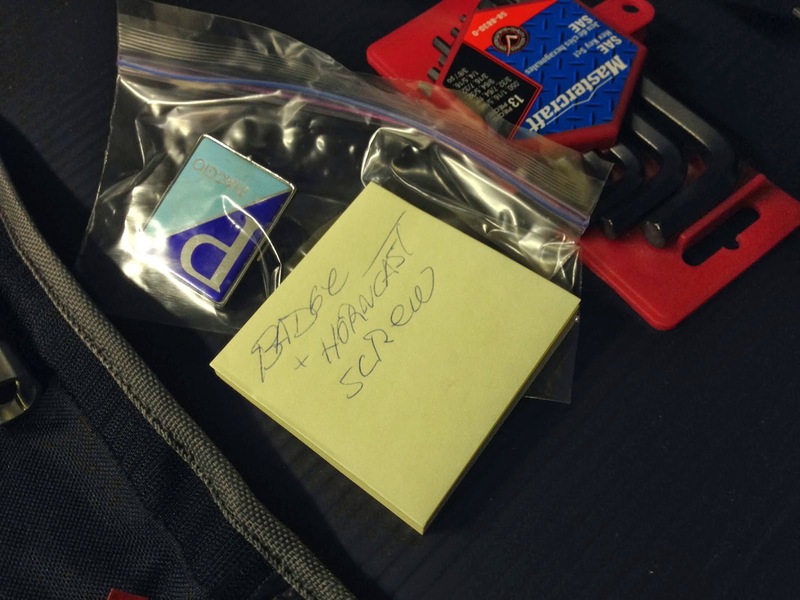 I also strongly recommend that as you remove screws and bits and pieces, you place each part, or related parts, in a sandwich baggie with a note on a scrap of paper so you remember where each part goes. This will go a long way to making the re-assembly painless, especially if the project extends over days or even weeks and your memory of what goes where starts playing tricks with you. 1. No project worth doing is complete without curve balls and stupid mistakes. You won't be disappointed. This project starts with a curve ball and that leads directly to a stupid mistake (quite a few, actually). 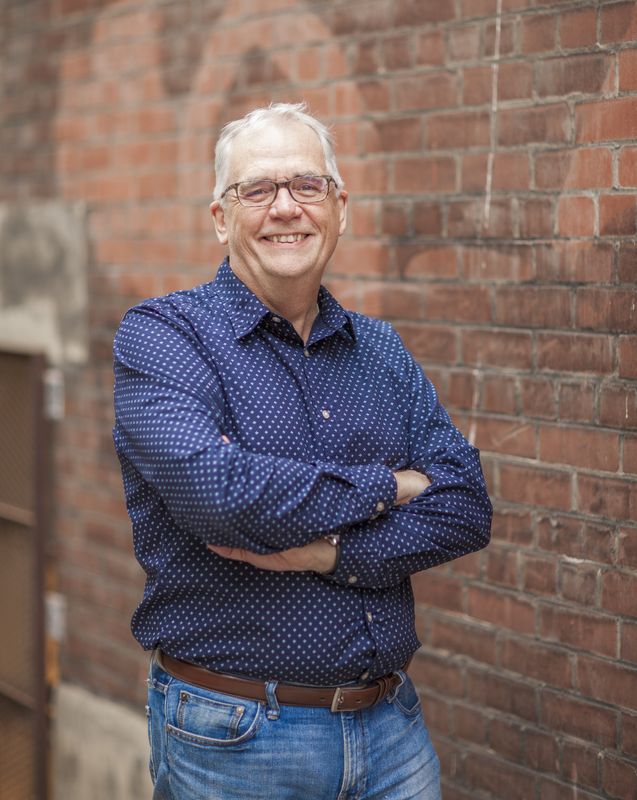 Be patient, there is value in sticking with this story, and it has a pretty happy ending. 2. 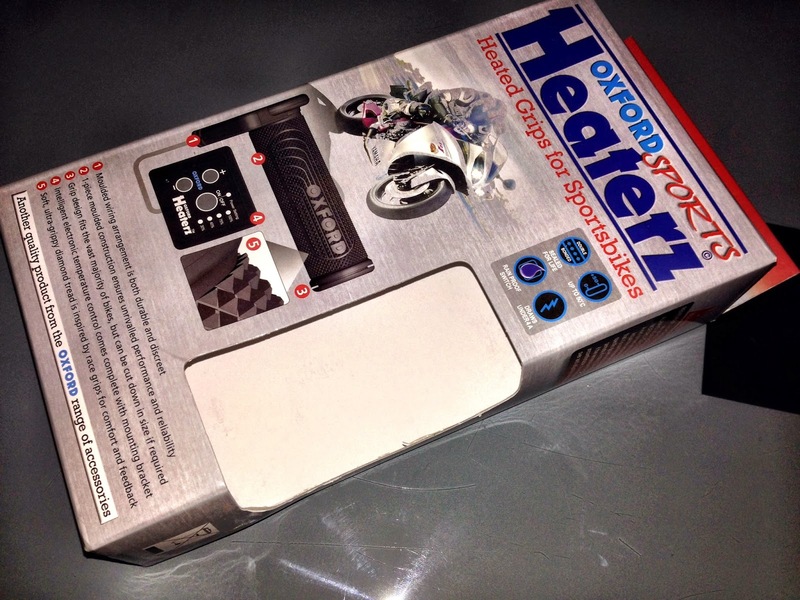 I received the Oxford Heaterz and the Warm & Safe Heat-Troller® as Christmas gift. My daughter Lauren played Santa and she did a great job. I spotted the curve ball as soon as I unboxed the present. 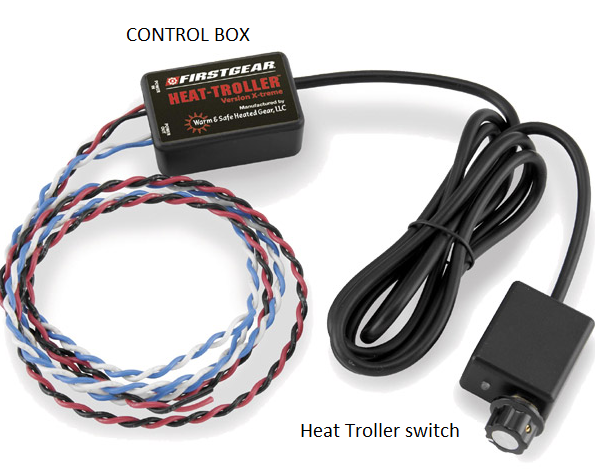 The model of Warm & Safe Heat-Troller® my daughter bought came with an enclosed control switch instead of an exposed circuit board. I wasn't at all sure how the heck I'd be able to mount that unit on the kneepad since the plastic of the kneepad is quite thick. This particular controller is designed for handlebar mounting on a naked handlebar, and not for mounting through a dashboard or fairing. 3. I knew I could exchange it for the other model, but I didn't want the hassle of mailing it back and paying for return postage, and the delay involved. I figured I could work around it and get it installed. Besides, I like a challenge and the opportunity to let my inner McGyver out to play. 4. My first thought was that I would simply remove the casing and presto, I'd have the naked model. That turned out to be impossible. When gentle prying failed to open the casing, I decided to take a peak inside by dremelling off a section of the back. Surprise! This thing is built to last! There is basically no cavity. The manufacturer filled the entire casing with resin. Wow! talk about waterproofing. From there I reasoned that I could just use the dremmel cutting wheel to trim back the face of the switch. Fail! for the same reason. That switch is impregnable. Even with all my cuts, the case looks the worse for wear, but has lost absolutely none of its integrity. I am really impressed with the quality of this product. 5. So I shifted gears. I hauled out my fine measuring instruments (micrometer, Vernier caliper), took my glasses off to take a good look at the exposed threads of the rheostat control. There wasn't much left, but there might just be enough. I figured I could countersink a hole in the kneepad leaving just enough material to anchor the control. First I tested my theory on a piece of wood. Bingo! Worked like a charm. Encouraged by this test, I attacked the kneepad with the same approach. Fail! If I had a drill press, I might have stood a chance. Instead I drilled clear through the kneepad. Now there was no chance of anchoring the switch using the threads on the switch and the plastic of the kneepad. 6. Undaunted, and still optimistic, I went back to thinking. I came up with the idea of using some kind of metal brace and a couple of screws to clamp the control to the kneepad. The small hole I drilled for the switch's LED served to locate the switch on the kneepad. After more thought, I settled on vinyl-coated perforated metal strapping. More measuring, scrounging some black enameled screws left over from a RAM project (never throw such things out! ), more dremelling, a little more drilling, and BINGO! Worked like a charm. 7. Here are the photos of the mounted Warm & Safe Heat-Troller. In the end this worked out really, really well. Much more robust than the control that I should have started with. Not that the inside of the kneepad is exposed to much grief, but the mechanics at the dealership might need to get in there (they'll be shocked with all the extra stuff they'll find! ), and if they do, they can't possibly harm that switch. 8. Just a note, you will see washers between the strapping and locking nut. The washers were making it difficult for the screws heads to sit flush on the kneepad, and turned out not to be necessary, so I discarded them. 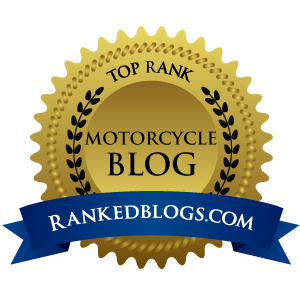 With the bench work done, it`s time to turn attention to the bike. 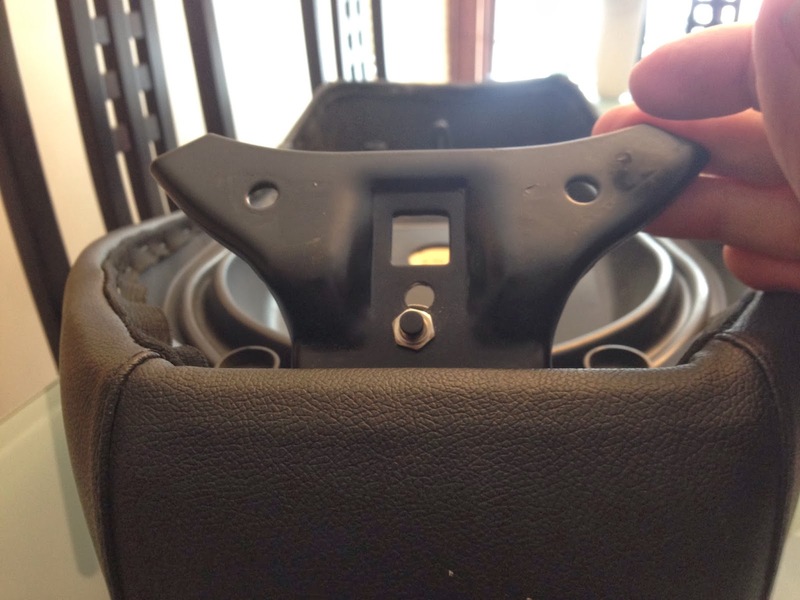 The first step is to open up the headset and gain access to the legshield. 9. The first step is to remove the windshield if there is one. These instructions are for a Vespa OEM screen. There may be slight variations for after market screens. Using an Allen key loosen the screws on the windshield supports so that the windshield moves freely on the supports. Next, locate where the windshield supports enter the headset. Using an adjustable crescent wrench, loosen the bolts. As little as a quarter turn may be sufficient and the rest can be done by hand. Once the supports are loose, the windshield can simply be removed. Certain after market windshield support become jammed in the tightened position even after the pressure from the bolt is removed. In that case, it`s necessary to push the loosened support into the headset socket, which will cause the mechanism to release. A light tap with a rubber mallet will certainly release the support. 10. Next remove the rear view mirrors. 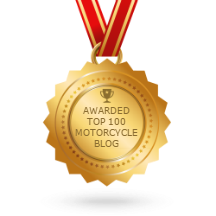 Simply grasp the mirror stem and twist it counter-clockwise and continue unscrewing until the mirror stem comes off the bike. 11. 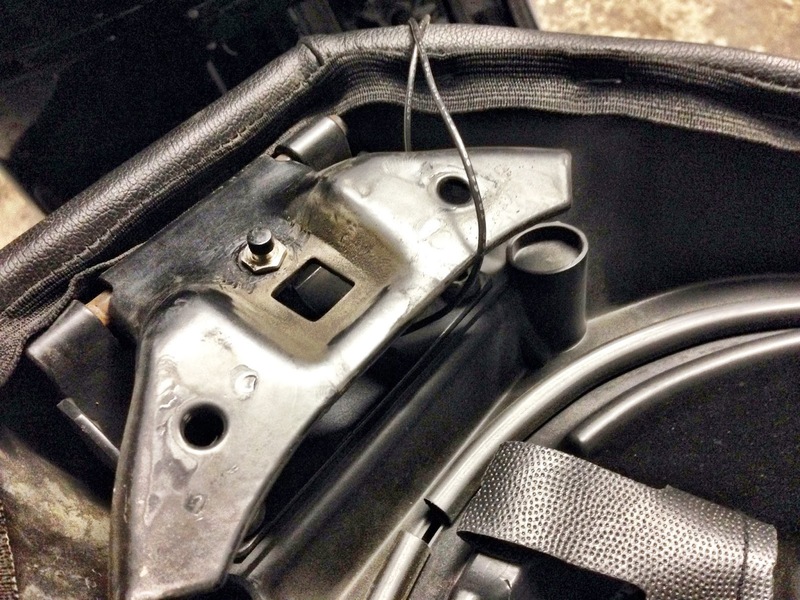 With the mirror stems off, using a small Allen key, remove the brake fluid reservoir covers. 12. Next remove the horn cast. This is the plastic nose piece that covers the opening in the legshield with the horn is located. 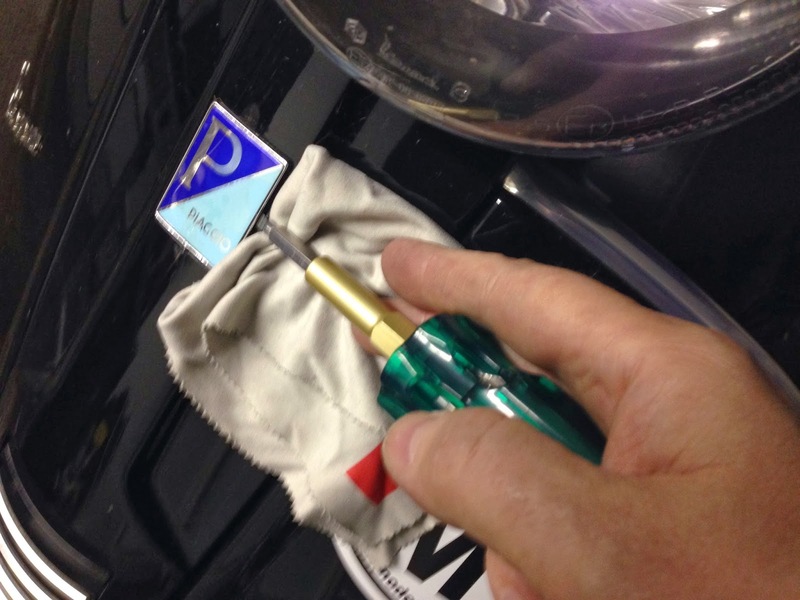 Using a rag to protect the paint, insert a flat blade screwdriver into the slot on the right side of the Piaggio badge and gently pry it loose. 13. Once the badge is removed you will see a Phillips head screw (all the screws for this project are standard Phillips head screws). 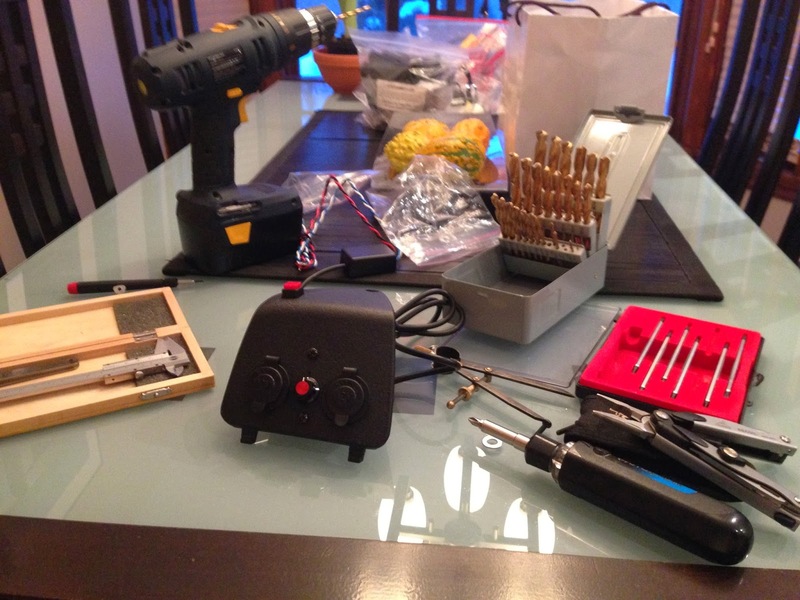 Remove that screw (a magnetized screwdriver helps). Next slide the horncast up and off the bike. 14. We're almost there. The next bit is a little tricky and fiddly, and there is some risk of loosing a key crew. Look carefully under the headlight. You will see a Phillips head screw. Remove that screw, taking great care not to let it fall into the legshield. If it does, you'll have to remove the floor board to retrieve it, which will add a lot more dis-assembly to this project. 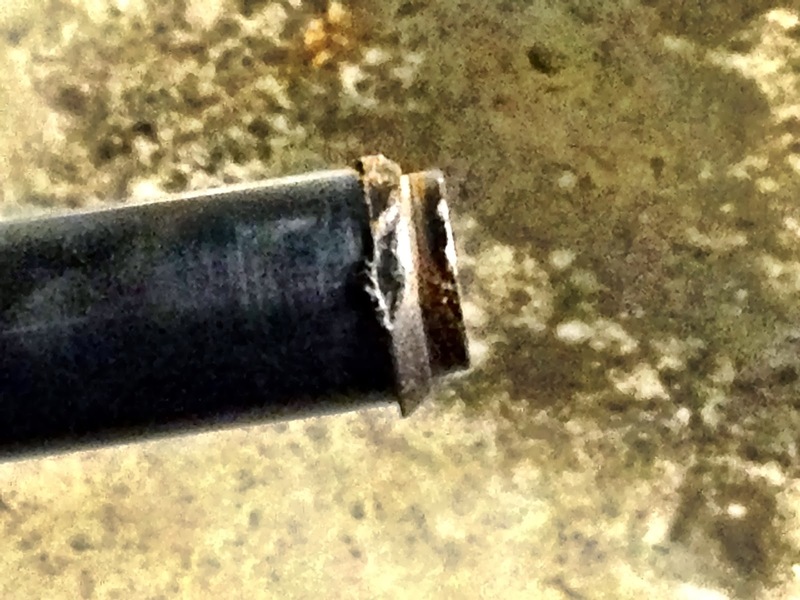 I strongly suggest using a magnetized screwdriver for that one. 15. Next, if you look at the underside of the headset from the back side, you'll see two small screws, one on each side near the brake levers that need to be removed. With all the screws out, begin the delicate task of wiggling and prying the front of the headset cover that has the headlight on it, loose. There are a number of plastic retaining clips that make this bit fiddly. For a while it might be impossible but persist, and it will come loose. 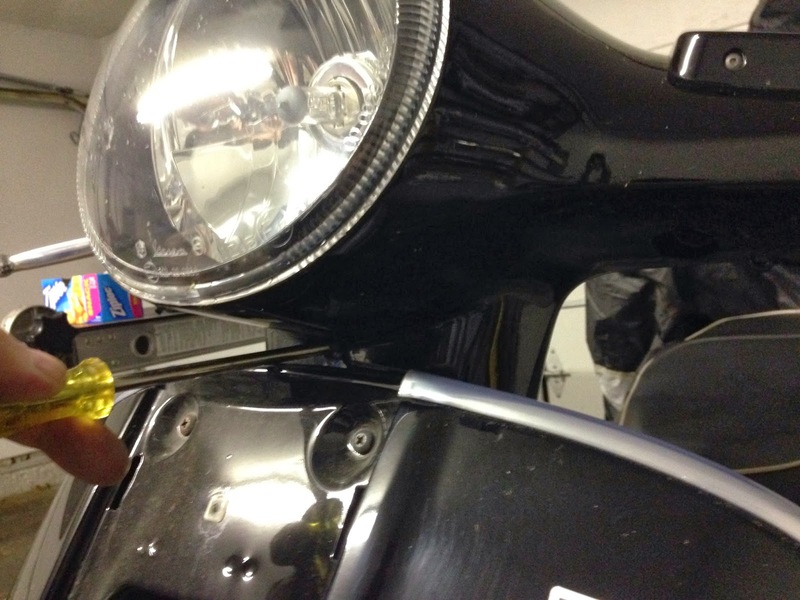 Once it's loose, disconnect the headlight and the parking light where the white plastic connectors are (the small one has a little catch that needs to be depressed) and now the front portion of the headset will come free. 16. Place the parts you removed in a safe place where they won't get damaged. 17. It's finally time to tackle the main objective: the grips. 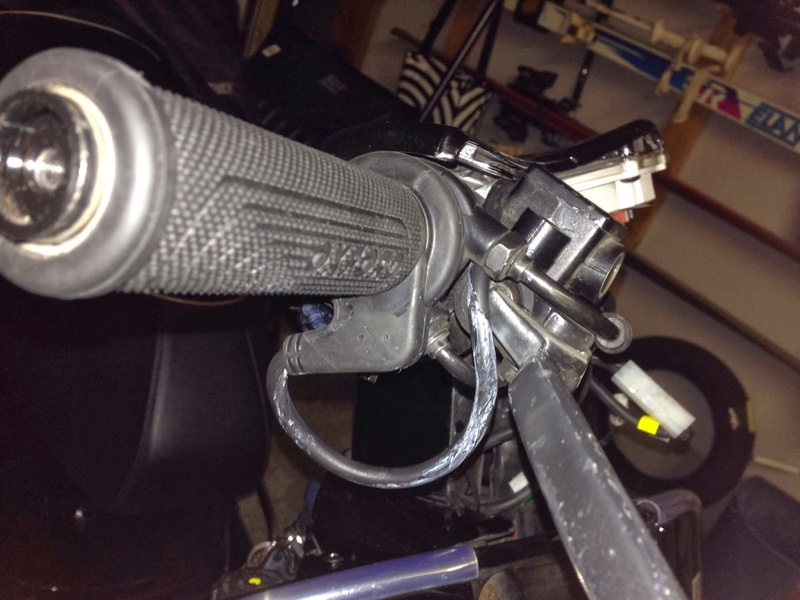 Using an Allen key, remove the bar-end weights. 18. 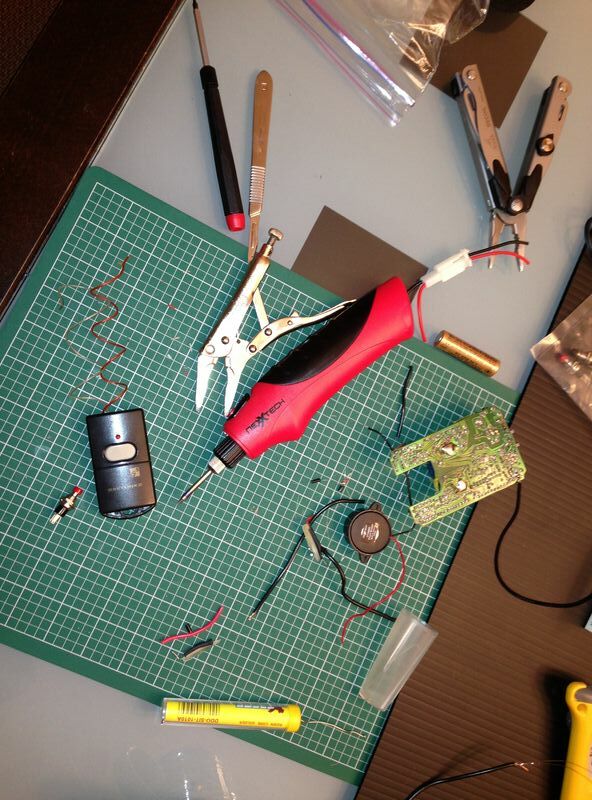 Starting on the left side, use your heat gun (it's possible that a hair dryer might work too). Begin heating the grip. Heat the grip uniformly all round. While heating the grip, take great care always to direct the heat away from the plastic headset or any other plastic parts. They are all made of thermoplastic and will melt and be ruined if they are heated. Once the grip is uncomfortably hot to your bare hand, begin twisting it back and forth in an unscrewing motion. Eventually you will feel the grip coming loose. 19. The more the grip moves, the easier this becomes. At the beginning it requires quite a bit of force to get the grip moving. 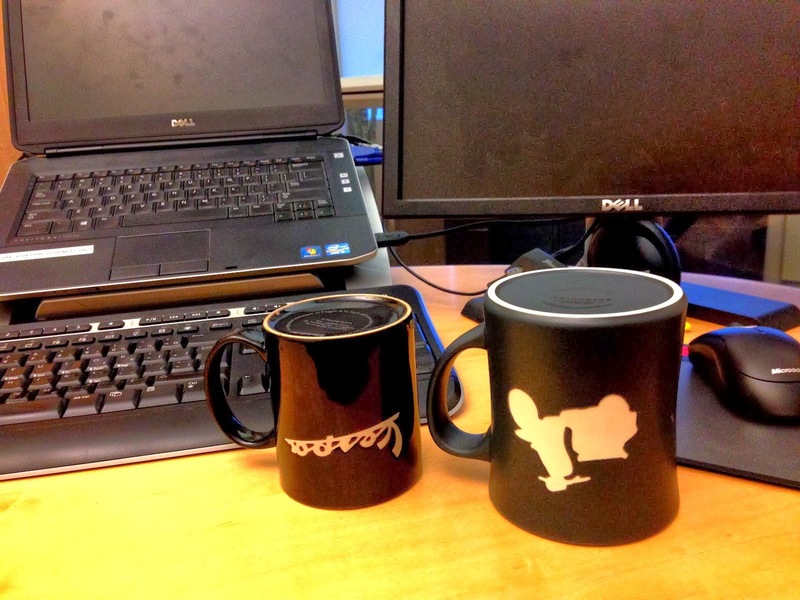 You are likely to need to reheat the grip at least once in the process. 20. 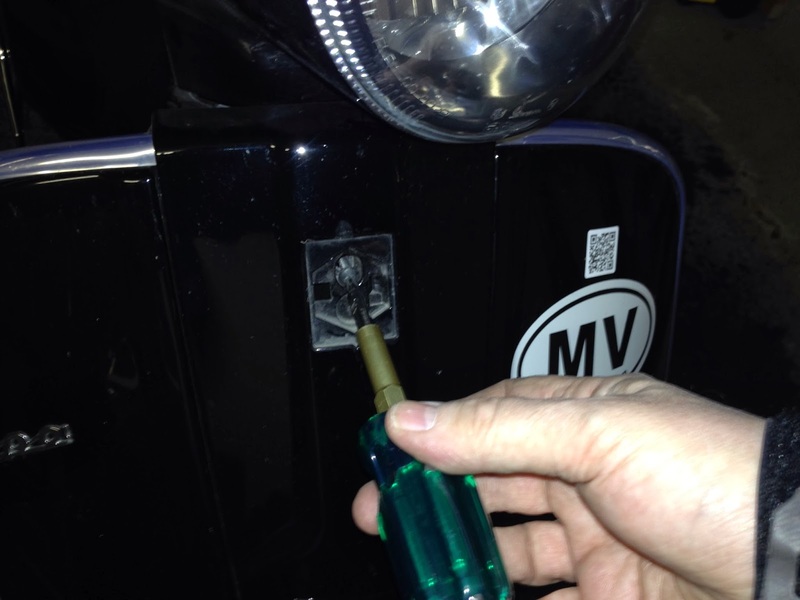 An alternative on the left grip is to use some spray lubricant, like WD40, with the plastic straw that comes with the spray can, and get some lubricant between the grip and the handlebar. This will work very well. Unfortunately I don't recommend this for the right grip which the throttle side. 21. 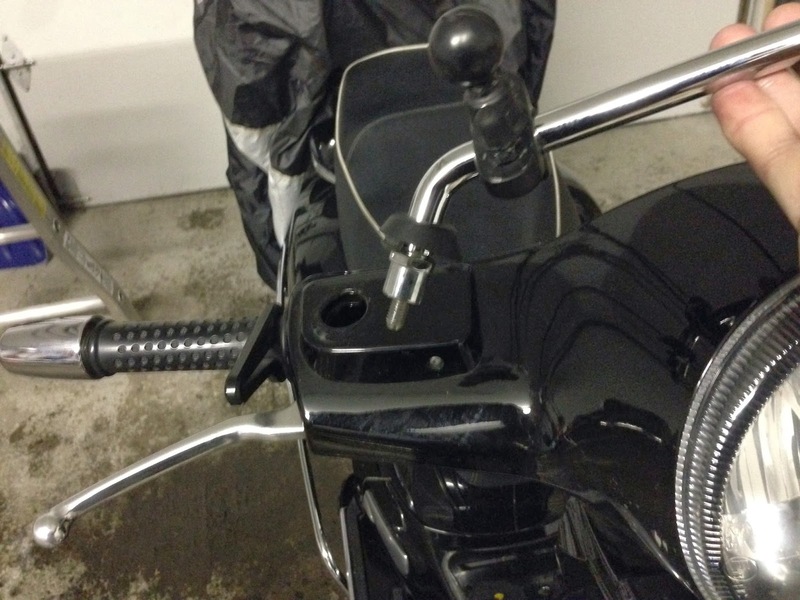 On the throttle side, the grip sits on a plastic throttle tube. Using the same heating technique, wrestle the right grip off. 22. 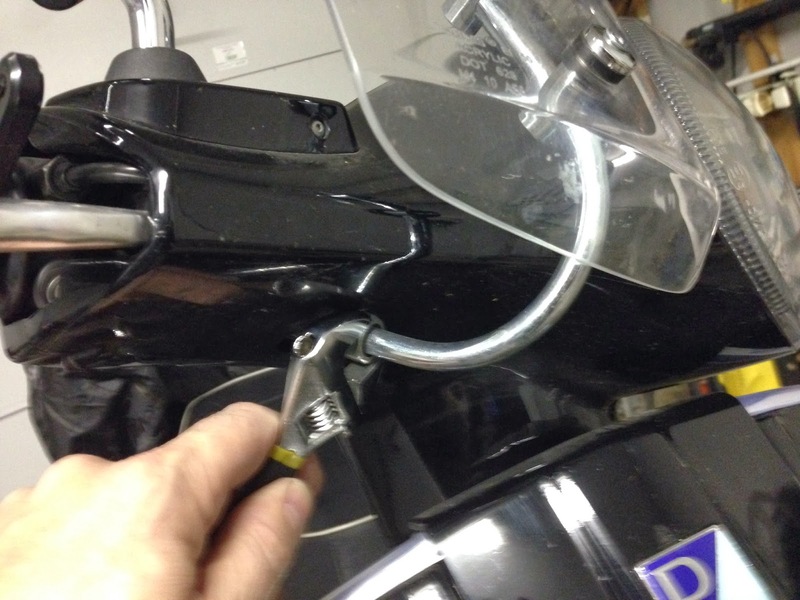 Once the grips are off, clean the exposed handlebar and throttle tube to remove any residue that will prevent the glue you'll need to use from setting properly. I used rubbing alcohol (methyl hydrate) to clean the surfaces. 23. 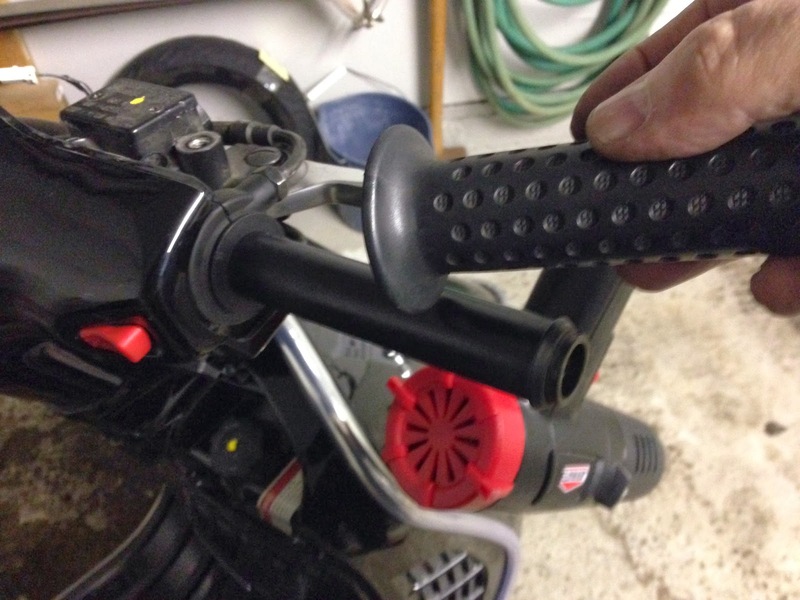 Dry fit the heated grips. They are a really nice fit. Notice that the right grip (the grips look the same but are identified as left and right, because the throttle grip has a larger inside diameter), and notice as well that the one that fits on the throttle side won't slide on. This is because the throttle tube on the Vespa GTS has a lip on the outboard side(whereas the throttle tube on the LX doesn't (go figure). That lip needs to be removed. Go at it gingerly with a box cutter or Exacto knife, or a scalpel if you're lucky enough to have one (I do but ran out of blades), and then finish the job with a flat file. Here is a photo of the lip, mid-destruction. 24. Now fit the right grip and see how nicely it fits. It's time to figure out how the grips needs to fit so that the wire on the throttle side can rotate with the grip as the throttle is twisted without binding in the headset or interfering with the throttle or the brake. Be aware of symmetry, if they both are fitted in the same orientation, the finished job will look good for years to come. Here is how I ended up mounting the grips. 25. Now for the part that is about like defusing a bomb in reverse. 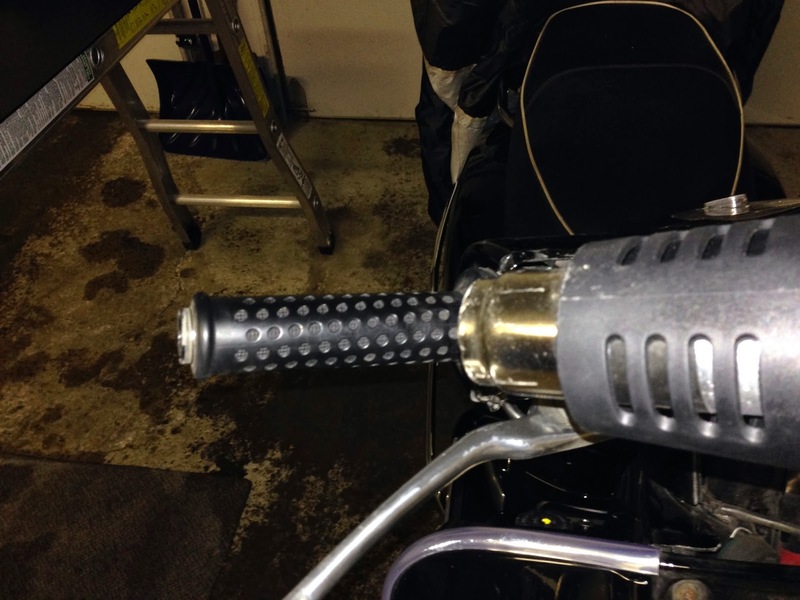 The Hot Grips on my LX were made fast with high temperature marine epoxy glue. That glue, while it sets fast, is still forgiving and allows some time to get the alignment just right. The Oxford Heaterz grips come with super glue. I hate super glue. It's too liquid, it gets everywhere, it will get on your fingers, and beware because it does bond skin very effectively. Practice another dry fit, to make sure that you know exactly how the grip needs to fit, paying particular attention to the orientation of the wire, and the distance from the end of the handlebar where the bar end weight will fit. 26. Once you're sure you've got it right, apply some of the supplied super glue to the bar. I ran a bead along the top which immediately began running down the side of the bar. I smooshed a little glue around, using the tube. I then lost no time fitting the grip. It was a little nerve wracking, but it worked out OK. I did end up getting glue on my fingers, down the wire from the grip, and some even dripped on to the legshield. I cleaned up the mess, then did the same steps with the other grip. 27. The white mess on the lead from the grip is super glue residue. Hopefully it will tidy up without too much grief. 28. It's a little difficult to tell in these photos, but I have the grips oriented so that the wires point straight back. It's the throttle side (first photo) that determined the orientation. 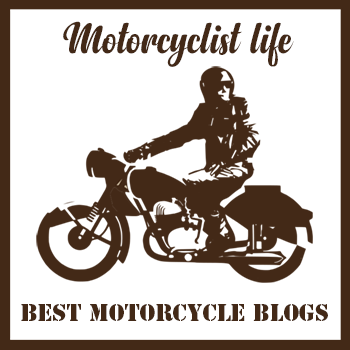 After trying different orientations, this one leaves the wire lead in a looped configuration that allows the throttle to rotate freely without interference. 29. With the new grips installed, it's time to turn your attention to the electrical connections. Thread the leads from each of the grips to the centre of the headset. Snap the quick connector from each of the grips to the wiring harness that came with the Heaterz grips. Here's another picture that leaves something to be desired, but has the benefit of showing the connectors for the left and right grips plugged into the "Y" configured wiring harness. The long tail of the "Y" is the piece that is fished from the middle of the headset down and out the left kneepad opening. 30. Feed the long end of the wiring harness down from the headset and into the left kneepad space and out the kneepad. Leave it dangling loose for now. 31. 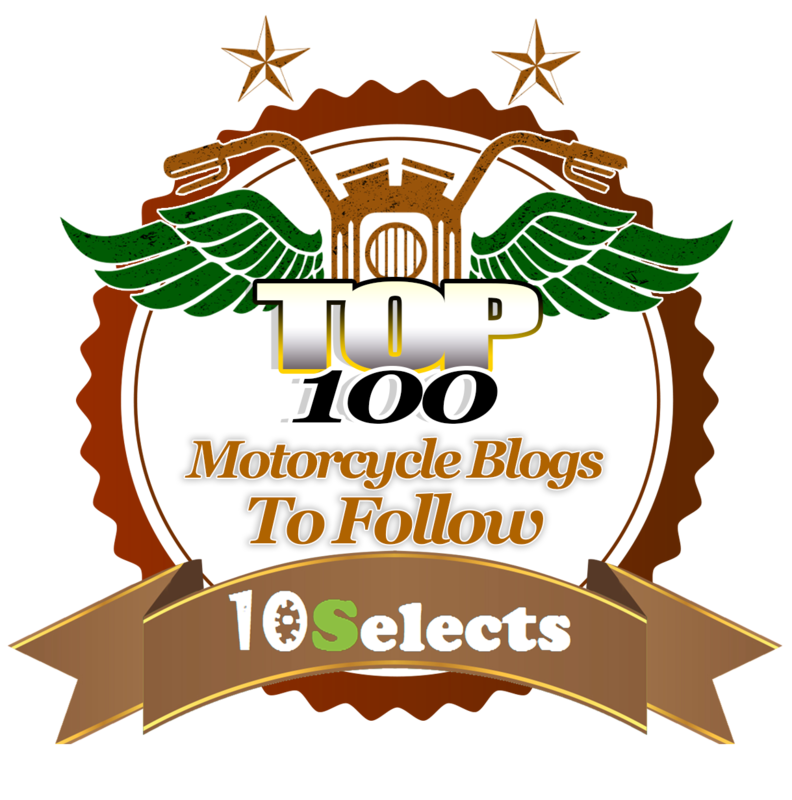 Take the left kneepad with the control installed and place it on the floorboard on the left side of the bike. 32. 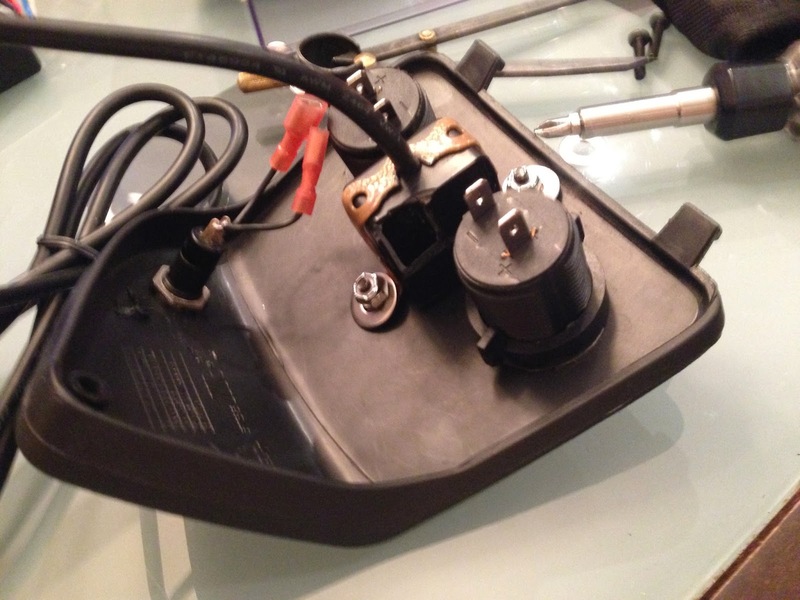 Using a Phillips screwdriver, remove the left turn indicator housing. The Vespa GTS offers much less interior space inside the legshield than the Vespa LX and there isn't enough room in the kneepad space to hold the Heat Troller's control box. The control box is the box connected to the Heat Troller switch unit by a longish black wire. The white and blue leads, and the red and black leads emerge from the other side of the Heat Troller control box. 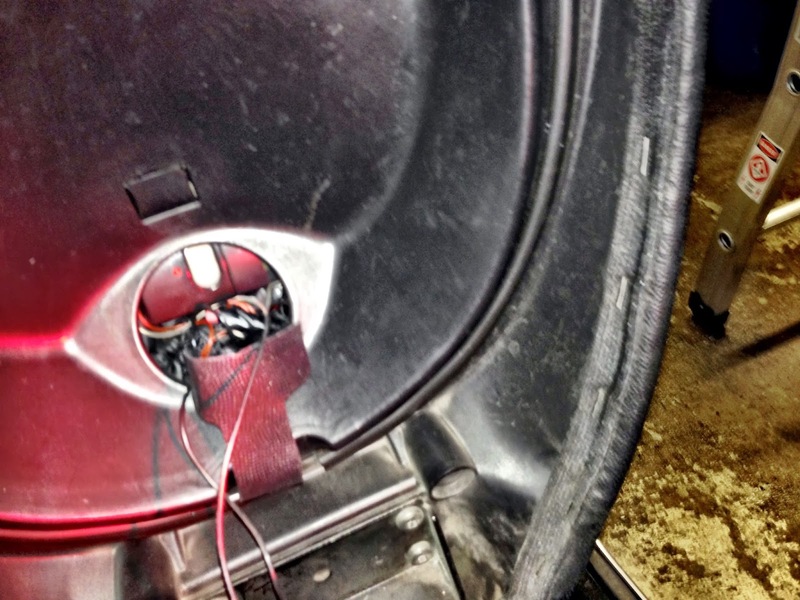 There is however enough room inside the leg shield just behind and to the left of the left turn signal housing. 33. Thread the blue and white, and red and black leads into the kneepad space, lead them out of the open turn indicator opening, and continue pulling the unit through until the Heat Troller Control box is in hand. 34. Use a tie-wrap to bundle up the excess black wire as close as possible to the control box and tuck that all inside that free space beside the turn indicator. Now thread the blue and white and red back up from the turn indicator space into and out through the left kneepad opening. 35. What you now have is an open kneepad, the blue and white leads and red and black leads from the Heat Troller, the black lead from the Heaterz grips with a white connector, and the kneepad itself, all hanging ingloriously out of the left kneepad opening. In my case there is even more stuff hanging out, including the 6 position terminal strip that distributes positive and negative feeds directly from the battery, fuse holders for the 12V outlets and the hot grips, and the relay that shuts off the power to those accessories when the ignition is off. It's a fair amount of stuff. Plus I'm not an engineer or artist, so there is probably enough excess wire to make an engineer cringe, and an artist cry. 36. Here's another video (a little premature because it shows the grips operating, but we're not quite there yet) that gives an idea of just how much stuff I've now got stashed in the left kneepad enclosure. 37. Because I installed 12V outlets and a terminal strip earlier, hooking up the Heat Troller and Heaterz grips is a cinch. 38. I took the positive connection for the grips by tapping the positive lead of one of my 12 volt outlets. 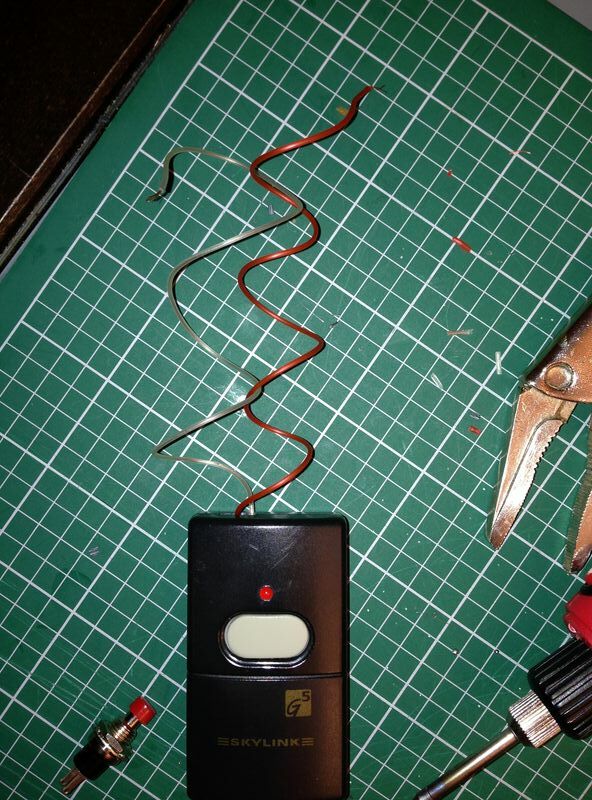 The ground connection comes directly from the battery on 12 gauge automotive wire via the terminal strip. That circuit is protected by a 7.5 amp fuse. The line that feeds the outlet is switched by a relay that gets its switching current from the GTS alarm connector. That way of wiring the grips means that the power to the grips (like the power to the outlets) will only be on when the ignition is on. That's a good thing because it means that it won't be possible to leave the grips running when I turn the bike off and remove the key. That's the configuration that Oxford recommends for the Heaterz grips. 39. Because a diagram may prove very helpful to others attempting this modification, I took the time to make a circuit diagram. If you need to see the diagram more clearly, click on it and it will open in a larger version in a new window. 40. To connect the wiring harness from the grips to the blue and white Heat Troller leads, cut off and discard the quick connector. 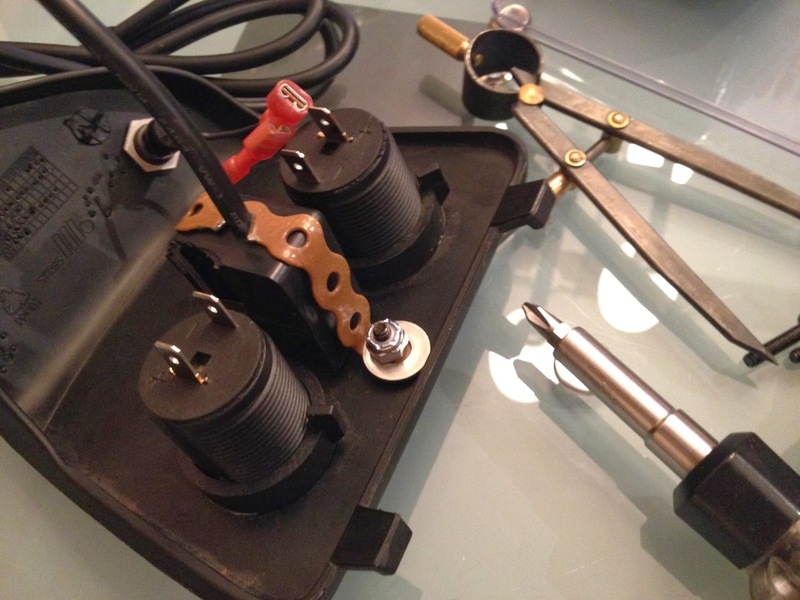 I made all my wire taps and connections using quick connectors. You can pick these up at hardware stores or at a specialty electronics store, which is where I got mine. You used to be able to get this stuff at Radio Shack (The Source, in Canada), but they have gotten out of the component business alltogether. 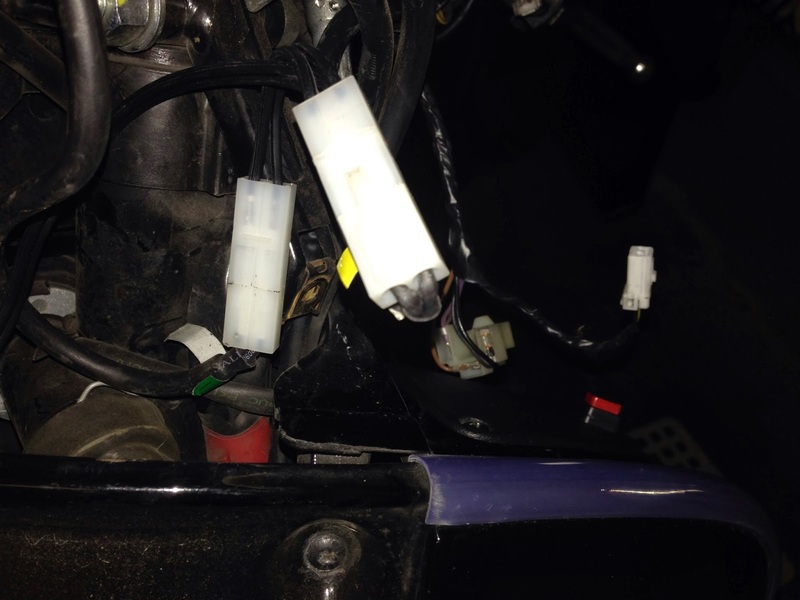 Here you see the connection of the heated grips to the blue and white Heat Troller wires. 41. The last step in this project is to wrap the quick connectors in black electrician's tape as an extra measure of protection, stuff all the wiring and components back into the left kneepad space and button the bike pack up (re-install the headlight portion of the headset, the brake fluid reservoir covers, the mirrors, the horncast and the Piaggio badge. 42. I believe that this wraps up another successful project report. Now all I have to do is wait for winter to loosen its grip so that I can test this modification on the road. I'll come back to this post with an epilogue to provide some commentary on the grips in action. Installed, tested, marvelous. Within a few minutes, the grips get uncomfortably hot to the bare hand. I'll be posting a detailed project report to show how it's done, but it'll take a while to get it posted. Here's a glimpse of the heat control seen from the rider's position. 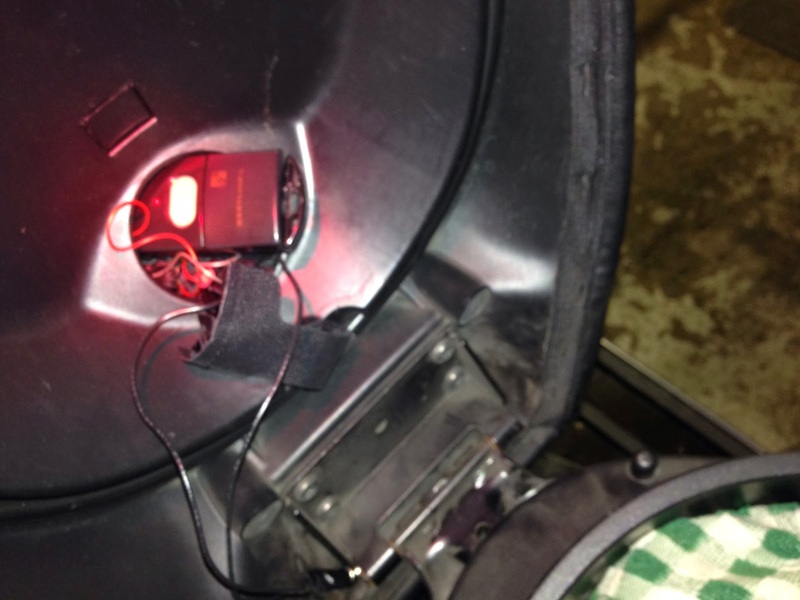 I was concerned that the LED for the control wouldn't be visible because it's fairly recessed due to the thickness of the kneepad plastic. But, as you can see, it turns out not to be an issue. I apologize for the background noise, no it's not the noise that heated grips make, it's my heat gun hanging overhead in an attempt (successful) to get the garage to a temperature conducive to working on the Vespa in light clothing.